The anti-fatigue compression sock, soothe tired, achy legs and feet! Miracle Socks, anti-fatigue compression sock, soothe tired, achy legs and feet! Miracle Socks use graduated compression, maximum at the ankle that gradually decreases up the leg, to soothe, massage and energize your legs and feet. Miracle Socks, as seen on TV, are comfortable and discreet, thin enough to fit in any shoe. Easy to put on, great for everyday use. Miracle Socks help to reduce swelling, enhance circulation, relieve symptoms of varicose veins and soothe aching legs and feet. Unisex. Perfect for being on your feet or sitting all day and traveling! Available in black and white. Revitalizing Benefits: Graduated Compression - Improves circulation and helps reduce aches and swelling Massages as You Move - To soothe tired, achy legs and feet Vein Therapy - Helps relieve symptoms of spider and varicose veins. I have to admit I had my doubts about these Miracle Socks I kept hearing everybody talk about. So I tried them, and I do not know what is in or on them that makes them miracle socks, but after the very first day I wore them, my lower calves, ankles and feet did not ache like they usually do when I sit down to relax for the night. It truly was amazing how much better my calves, ankles and feet felt after wearing these Miracle socks for just one day. I wear them all the time now. Glad they are machine wash and dry!!! These socks keep my legs from hurting on long trips or flights, or just sitting at my desk for the day. Bought for my wife, now I get benefits too.. . These are a great help with my aching legs. More comfortable than most support hose. I walk nearly everyday and my job requires me to be on my feet for long periods. My doctor suggested that I use a compression type sock. I had seen the Miracle Sock, figured I would try them. I found them to be comfortable, soft, and warm. My feet feel massaged with them on. I plan on buying another pair. I would suggest them to anyone. I like the weight and feel of these socks. I&apos;ve recently developed mild varicose veins, and I did notice less leg fatigue after wearing these socks for a day. That said, however, I am a short 5&apos;3 and my shoe size is 6 1/2 ladies; right now the smallest size I can find in these socks is a Small/Medium, and that is just too big. As a result, I don&apos;t think I&apos;m getting the benefits I would if these socks fit more snug on my feet and ankles. So, until there is an XS option, I will not be buying another pair. My job requires I be on my feet for hours at a time. This can lead to some very tired and sore feet. 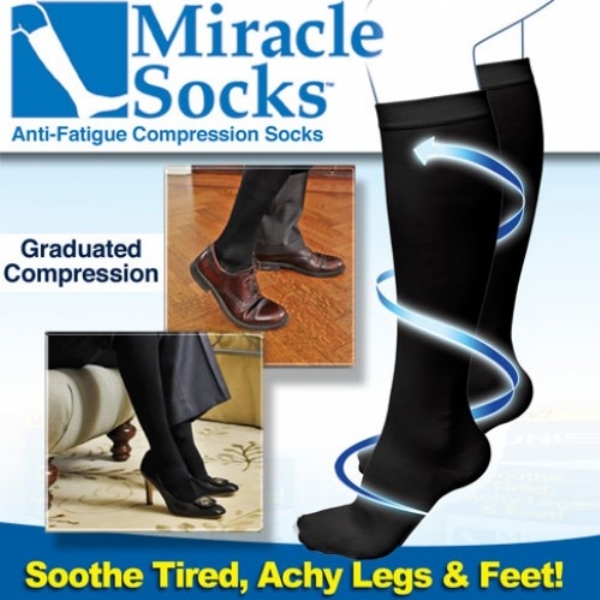 The miracle socks have greatly reduced the fatigue and pain. I recommend them. They&apos;re hard to put on with the arthritis in my thumb but after I get them on they feel good. I have varicose veins and standing all day at work caused me great discomfort. Wearing the Miracle Socks gives my legs support and they don&apos;t seem to ache as much or get as tired. I hope the socks will hold up to many wears. So far they seem good. I was surprised how they relieved the swelling. Such a difference. Will probably buy more. This item does exactly as advertised and very affordable. A Dr recommended them as comfortable but necessary for my edema. She was right. Love them. I bought these socks when they first came out and have recommended them to other friends. The main reason I like these socks so much - better than other trouser socks - is that they stay up. Never had a problem with these socks being around my ankles after I have worn them a few hours. Wish they came in brown and dark blue. I have only wore these once. They are nice and tight and seem to do what they are supposed to do.